Properly training for a race is key to your running success. Not only does appropriate training ensure that you’re able to run the entire race distance, but it also helps you avoid injury. The amount of work put into the weeks and months leading up to a race is critical for achieving your desired time and distance goals. At some point during training, you may hit a plateau or level off in your progress. This is a natural occurrence and definitely not something to put yourself down about. Luckily, these types of plateaus can be overcome by simply examining your training routine and switching up your runs. And one of the best ways to accomplish this is with progression runs. 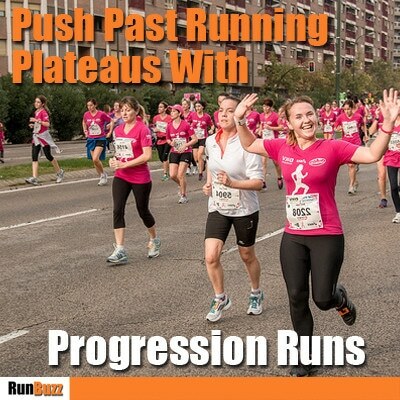 A progression run is a workout that starts out at a comfortable speed then gradually gets faster. Simply put, your ending pace should be faster than the one you started at. Easy: These training runs are often ran without even knowing it. Easy progression runs start out at a slower pace but still offer a challenge by minimally increasing the speed during the workout. To do one, start your run with 15-30 minutes of running at a slow pace. Then run the same duration but slightly faster. Your entire run should be slow, but you should be starting out very slow. Mid-range: Medium to long in length, these types of progression runs aim to add a level of aerobic stimulation to an already fatigued state. By incorporating mid-range progression runs, you can train your body to maintain a fast pace for longer. On your next run, purposely try running the last half at a moderately faster pace than the first half. Or, if it’s a long, run, aim for running faster during the last 30 minutes. Pre-Marathon: Arguably more difficult than the previous two types, pre-marathon progression runs help replicate race day conditions without putting too much stress on your body. They are longer in distance and your ending pace should be at a half marathon pace or faster. Threshold Progression Sets: These aim to improve your fitness thresholds by having you run shorter distances at faster than race pace with a short period of rest. After warming up, try running 3 x 3 mile repeats, each at faster pace than the previous. What Are the Benefits of Progression Runs? Progression runs give your body time to warm up, a period to run at a comfortable pace, and the ability to sustain your run even when tired. They help you avoid injuries when training by beginning your run at a moderate pace. Starting out a run too quickly can increase your risk of injury and put unnecessary stress on your system. Another benefit of progression runs is that they increase your speed gains more quickly. Progression runs are less demanding on the body than other types of workouts, such as tempo runs or intervals, which means that your recovery from them is quicker. This gives you more time to fit in other runs, helping you to progress faster. As if you weren’t already sold on progression runs, a third benefit is that they teach your body how to properly behave during races. Some people have a tendency to start out too fast during a race. While they may be running at the head of the pack in the beginning, they’re often struggling by the end. Not only do progression runs teach your body to run faster in a fatigued state, they mimic how you should be running a race: slower at the start with an increase in speed at the end to finish. How Do I Incorporate Progression Runs? Although they may be less intensive than other types of runs, progression runs still require a solid running base. It’s advised that runners with less than 6 months of consistent training avoid doing progression runs. That being said, no matter what distance you’re preparing for, doing one progression run a week will help ready you for more intense training down the road. The list of different types of progression runs above can be used to determine which type would be most beneficial for your training distance. If running a 5K or a 10K, progression runs should be used early in training and can be swapped out with longer, faster runs as training continues. For half marathon or marathon training, progression runs should be longer in distance and used later in training. The best thing to do when starting out a progression run is to monitor your pace and/or heart rate in order to increase your speed as the run progresses. While more seasoned runners can often do this by feel, using something that gives you quantitative data is usually the best way to learn how your body feels as it’s exerting more effort. Erin is the blogger behind Erin's Inside Job, a site that chronicles her journey through addiction and focuses on maintaining a balance between physical and emotional wellness. She is an avid runner, fitness coach, and currently studying for her personal training certification through NASM.